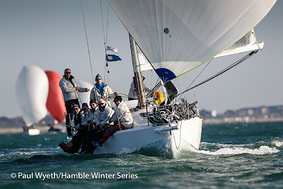 Week six of the HYS Hamble Winter Series dawned with blue skies, beautiful sunshine, and a forecast for some breeze, though nowhere near as much as the two previous weeks. What could possibly go wrong? Well, as it turned out, the Committee Boat, Jabberwock, refused to start and an urgent message was sent ashore. With Andy and the River Taxi alongside, the combined brain power ascertained that it was not a loose wire, or a faulty starter battery, but that the house battery bank was to blame. With that turned off, the little 75amp hour starter battery kicked the engine into life and all was well. 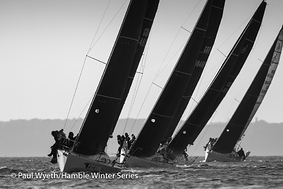 With the battery bank now slowly charging, the Committee Boat headed for East Knoll and the Race Team WhatsApp'd the fleet with their intentions. The forecast was for the wind to go to the East but it was 060 when they arrived on station and it never went past 070. With that direction and the forecast in mind, PRO Kathy Smalley decided on courses containing triangles, sausages and beats. The number of triangles and sausages depended on the size of the boats. Class 1 and 2 would in fact go to Royal Thames twice whereas Class 3&4 would not. 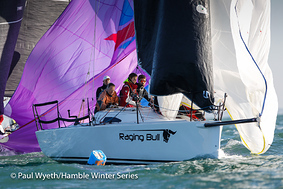 All classes finished with a spinnaker reach to hamblewinterseries.com. There was significant, though neap, tide crossing the start line and this made the decision on where to go interesting. Most teams in Class 1 decided to hog the CB end which led to a number of performance enhancing expletives being heard. Pegasus DekMarx went to the pin and made a big initial gain. With a large NKY Lines container ship in the Thorn Channel, the PRO was relieved to see that the fleet knew that they had no rights whatsoever, and that they all behaved impeccably. Davanti Tyres, Chaz Ivill and Paul Heyes, pipped Sailplane, Rob Bottomley, once again on handicap in Class 1, with Pegasus DekMarx, Malcolm Wooton in third. This Class is becoming a bit of a three horse race in that order. In Class 2, JAGO, keen to keep tabs on Jiraffe, was OCS, despite what Mike Yates said later in the bar. They spent the race "clawing their way back into third place" as Susie put it. Hot Rats, Robbie and Lis Robinson and Malice, Mike Moxley found the right hand side of the first beat paid, but JAGO went left up the second beat and put herself back in contention. Archeron, Kerr 33, Andy Hunt making her first appearance of the series won on the water, but had to give way to Simon Perry's Jiraffe on handicap. 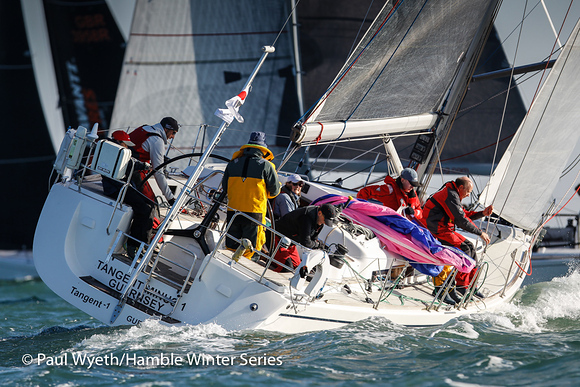 Sabriel Jr, J88, Dirk Van Beek, did something interesting with her spinnaker and retired. In Class 3, With Alacrity, Chris and Vanessa Choules, are racking up some pretty impressive numbers whatever the wind strength. 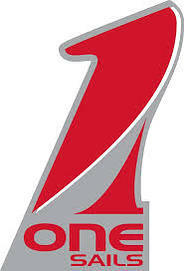 With 8 points from 10 races they are currently discarding a 2! Jamie Muir's Scarlet Jester is 4 points back having come in 3rd on the day. They were beaten for second by David Greenhalgh's J'ronimo. John Noe in the X-332, La Nef 1V, back in ninth place on the day commented on the "Fabulous weather and a fabulous course." He was less complementary about his own performance. Protis, Catrina Southworth's latest quarter tonner, took first place in Class 4. She is being sailed by hubby Ian and the usual suspects. Toby Gorman's Stan the Boat, chased them hard round the course for a second place. He is no doubt happy that Protis cannot now get the six starts required to challenge for the series. The other quarter tonner, Flash Heart, Jeffrey Dakin, came in third place with M'Enfin!? Corby 25, Chudziak and Malas, having a very disappointing 10th, which went straight in the discard bin. No wonder they were not available for comment in the club. Behind the Class 4 leaders, the HRSC Impalas are having their usual close battles. Imptish, Barney Smith, beat Polly, Ben Meakins, by 9 seconds on the water. 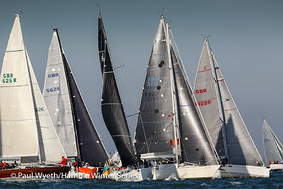 Under their respective IRC handicaps however, Imptish lost by 7 seconds, which left Barney chuntering on about the rule. Uproar, Andy Chapman, was some two minutes behind, which made any rating comparisons irrelevant. 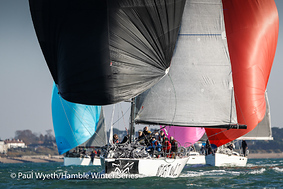 Two Frank, formerly Olly Love and Samantha Flint's Impala, was seen heading for Cowes with its new owners, and a ton of sails, having been handed over on Sunday morning. Back in the clubhouse the day prizes were presented by One Sails, who had both Peter Kay and Ian Brown in attendance. 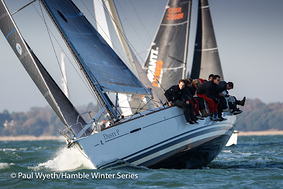 One Sails are regular supports of the HYS Hamble Winter Series and Peter Kay congratulated all the competitors for turning out and especially those who kept his business going. Malice, Mike Moxley, was granted redress for standing by the MOB situation of the previous weekend, and in addition, Mike was handed a bottle of wine by Kathy Smalley, who understands from her own experience how important help can be when things go wrong on the water. As was the case on the race course, big smiles were the order of the day. Next week NJO Sails of Shamrock Quay will be the Day Sponsor.